Members of the Bolshoi Ballet perform Oath of the Ushers. The Napa Valley lies forty-five miles north of San Francisco as the crow flies. In the summer, when the city is often shrouded in fog or quite chilly from the ocean breeze, Napa Valley, with vineyards stretching its entire length, boasts of weather and landscapes to rival most bucolic Mediterranean locales. Given the climate, it makes sense to call the ten-day marathon of wining, dining and performing arts the Festival del Sole. The lure of principal dancers Irina Dvorovenko and Maxim Beloserkovsky from American Ballet Theatre on one concert and members of the Bolshoi Ballet performing Vladimir Vasiliev’s choreography accompanied by the Russian National Orchestra on another is enough to get me behind the wheel for a long drive. Unfortunately, no press tickets were available for the dinner concert featuring the violinist Joshua Bell and dancers Maria Kochetkova and Vitor Luiz of the San Francisco Ballet in a premiere of Yuri Possokhov’s Adagio from Spartacus. With a title like Seduction, Smoke and Music: The Love Story of Chopin and George Sand, I am hoping for a multi-disciplinary blending of music, dance and theater that illuminates the attraction and artistic inspiration between composer and writer. Even with a script by James Melo, directed by Donald T. Sanders, with Vanessa James’s production design and lighting by Beverly Emmons, the piece never coalesces. All the disparate elements have their own individual flickering moments of brilliance, but only overlapping in a superficial way. The chosen Chopin compositions, performed by pianist Simon Trpčeski and cellist Nina Kotova, do actually follow the intended dramatic line, but the actors, Jeri Lynn Cohen as George and Michael Sommers as Frédéric, only manage to tell the story through the dialogue, often based on letters and journals, and not through any rapport on stage. Cohen reads her lines from sheets of paper (had she been announced as a last minute replacement I could have been more forgiving) and at times she obscures half her face behind the papers and is too busy reading to make eye contact with the man she loves. Sommers has a strong stage presence though often his characterisation verges on the manic. The set itself is an obstacle course for all the performers, particularly the dancers. With the musicians placed upstage center and enormous armchairs and desks, one set on each side of downstage, the traffic patterns are awkward at best. Sand and Chopin are forced to spend most of the time on opposite sides of the center space which is visually obstructed by two squat stone columns at the footlights on either side of the stairs coming up to the stage. Sitting on a folding chair in the courtyard of a Disneyesque Tuscan castle instead of a proper theater, I remind myself to be charitable as there is nothing to be done. Irina Dvororenko and Maxim Beloserkovsky dance the Waltz in C-sharp minor, opus 64, no. 2 from Fokine’s Les Sylphides. It is painful to watch as they carefully gauge every move so as not to run out of space in completing a phrase or even to avoid bumping into the furniture, not that their expressions belie any difficulty. In the more stationary moments they are lovely – he with a poetic yearning on his face and she as a gentle muse – and despite the limitations, they do create moments of lightness and effortless grace. Toward the end of the second act, as Chopin is in decline and the end is not far off, they have another pas de deux to the Nocturne in D-flat major, opus 27, no. 2. 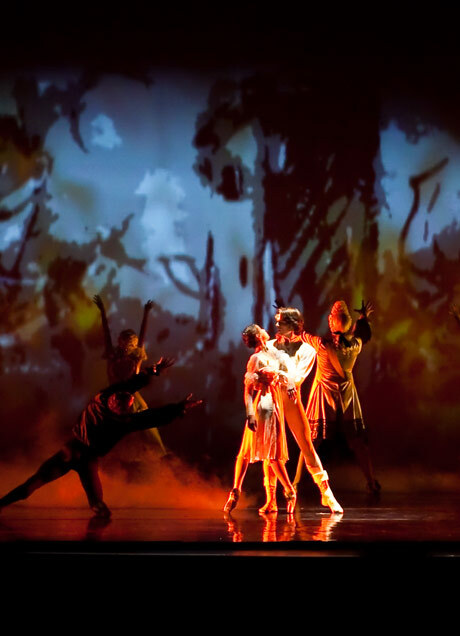 No choreographer is listed and the dance is reminiscent of Ashton’s Marguerite and Armand, recalling happier times in the face of impending death. The choreography is spatially more contained so the set doesn’t impinge as before, though I cannot see much that occurs center stage due to the columns. What a pity that the production does not afford the dancers the chance to perform full out, or even replace the actors in illustrating the relationship between Chopin and Sand. Fortunately the musicians are top drawer with pianist Trpčeski in command of a demonic technique, crisp articulation, and exceptionally clear voicing. He could use a bit more rubato in the quieter pieces, but his speed and ferocity in the Scherzo in B-minor, opus 20 are absolutely breath-taking. Kotova, on cello, is excellent technically, even if she doesn’t move me emotionally. The following day at the Lincoln Theater in Yountville An Evening of Dance with Members of the Bolshoi Ballet, part of the Dede Wilsey Dance Series, is accompanied by the Russian National Orchestra. The opening Oath of the Ushers, based on Edgar Allan Poe’s The Fall of the House of Usher, has surprises both good and bad. Under the baton of Emil de Cou, currently Music Director and principal conductor at Pacific Northwest Ballet, the orchestra brings to life the original score by San Francisco-based composer Gordon Getty from his Ancestors Suite. The combination of an experienced ballet conductor with a talented ensemble highlights the composition’s structure, shifting between neo-classical and a more contemporary feeling while still providing a clear rhythmic framework for the dancers. Vasiliev’s choreography belongs to the old Soviet style and crams pure classical steps and phrases into an ill-fitting frame that wants badly to be modern. And at the same time, in the roles of the ghost ancestors, the corps de ballet is given some movement that is intriguingly distorted and grotesque. 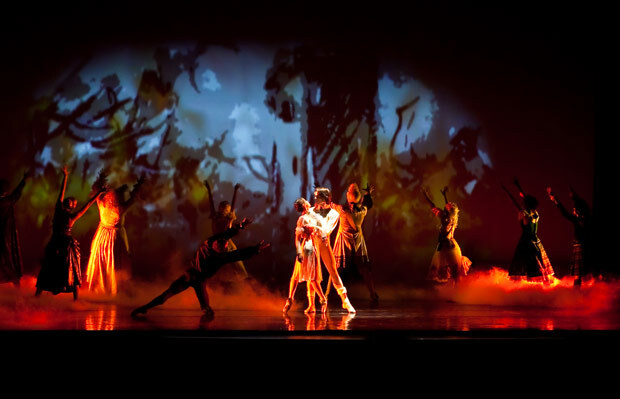 Vasiliev also designed the scenic projections which either provide the appropriate eerie atmosphere or are totally distracting. Daria Khoklova and Ivan Alekseev in Oath of the Ushers. Darya Khokhlova, a pretty young soloist from the Bolshoi Ballet, is Madeline, the twin sister of Roderick Usher. She is mad and refuses to sign the covenant which preserves the family’s immortality, then while retreating from reality she dances herself to death. Khokhlova has the requisite innocence, not to mention a very fluent technique, but she does not yet have the dramatic experience to help her define the depths of her character. Ivan Alekseev as Roderick is a very handsome, if vapid young man who dances well enough, but offers little on the artistic side. Only Bolshoi lead soloist Yan Godovsky, in the role of Roderick’s friend Eddie Poe, impresses with his muscular technique and intense emotional presence. Chopin’s Ballade No.1 (in G-minor, Opus 23) is the backdrop for the next ballet bearing the same name and seventeen-year-old prodigy Conrad Tao at the keyboard is easily the focal point. Vasiliev created this piece in 2010 as a tribute to his wife and partner on stage, the great ballerina Ekaterina Maximova who died in 2009. Godovsky plays an older man reflecting on the past in the role originated by the choreographer and Khokhlova reprises her role as the young woman, a fresh ingenue. The use of an upholstered black chair on wheels could almost be product placement for Office Depot and is in equally poor taste. Why not an antique wooden chair with a history of its own, or ideally, no chair at all? Tao’s playing is superb; his technical and interpretive nuances drawing everyone into his own magical world. A pity the choreography doesn’t have that power or even come close. Francesca da Rimini, the closing ballet to Tchaikovsky’s score, uses the three soloists in what now seems like stereotypical casting, two naïves versus the evil one. Again Khokhlova and Alekseev are out of their depth and Godovsky can only dig himself deeper into the same overly dramatic role he has played before, but at least he is a powerful performer who can hold your attention. None of these three works develops its plot enough that you could deduce the narrative without first having read the synopsis. And none of them offers the dancers much in the way of complex characters or innovative choreography to feed their appetites for a juicy role. I don’t regret spending two afternoons in the warm sun before the unbelievably early performances ( 6 and 6:30 curtain times), but overall, the dancing, no matter how artistic or technically accomplished, is seriously hindered by the productions and/or venues. Napa Valley has an abundance of wealth, but the funding needs to be put into the hands of people who really know how to run an arts festival, and not just given to the kind of promoters who use the arts as window-dressing to spruce up what is basically an opportunity to eat, drink and be merry. Aimée Ts'ao, a San Francisco dance writer, has appeared in Dance Magazine, was dance critic for the Bay Area Reporter and was the senior ballet editor for the Dance Insider Online. She lets her previous incarnation as a professional dancer (ballet and modern) imbue her perspective and hopes you like the resulting flavour.